Released in 1998, Metal Slug 2 was worse than Metal Slug X, which came a year later, in almost every way. More slowdowns, less weapons, less vehicles and lesser challenge to name a few things. Like the first Metal Slug, 2 has you shooting your way to the end, but this time you get to shoot mummies and aliens too. Best time on Easy difficulty: 0:18:25 by Jeremy 'DK28' Doll on 2014-05-07. Best 2-player time on Easy difficulty: 0:19:45 by Jeremy 'DK28' Doll and Christian 'Koopa Kid' Welsh on 2014-05-13. Easy 0:18:25 by Jeremy Doll. This is my first submission to SDA in quite some time. I've always been around the forums and stuff, but real life has kept me pretty busy. But being back on a more stable routine has allowed me to attend AGDQ '14, one of the most awesome events I've ever attended, start streaming myself and get some SDA worthy runs going. So expect to see me submitting like I used to! As I always like to do first, Thank You to SDA staff! I've been around for many years and seen the changes that have occurred and this site remains the only place I actively visit and post on. Thank you for keeping this such an awesome place and community to share and post great runs by many runners. 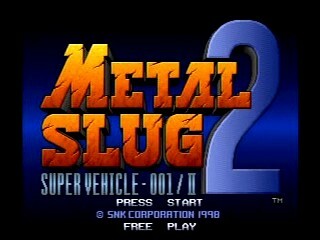 Metal Slug 2. I've wanted this run for a long time. My original submission was rejected, it was a bummer at the time, but I always understood. I just never got back to it. I have corrected that now. My original run was just over 20 minutes IIRC, so this is a monster improvement. This game holds so much nostalgia for me, I'm happy to be able to submit this again. It's also the glaring omission for the Metal Slug section of SDA's game list. I'd also like to thank Mr. K for being a big Metal Slug 2 fan, supporting me and being the man who got my stream up and running in the first place. You are the King. Zallard1. You always stay up late for my stream and bring me good luck. Thank you my friend. Gildersneeze for also being a fan of the Slug series and always bringing the ruckus to my channel. Joecoolgames. He made me a nice layout for my stream and another one for Metal Slug X. That run is coming soon. Also, thank you to all my chat regulars. You guys make it so fun to do these runs. You make this possible. Bonus points if you've realized I always do the character selection when the timer is on 28. Straight forward. I pick up 2nd Lt Hyakutaro for the extra damage on the tower fight. He is too awesome for words. I bomb the boss in that particular spot as it hits the wing and the body of the plane and registers as double damage. This level really was perfect. The first half went great, it's a lot of lag management with all those beautiful tress flying by in the background. I get a medium death animation for the boat fight. It wasn't the worst, so that's a plus. New plane strat here as I fly over a lot of stuff in the beginning, but I need to come down for the bomb drop. Perfect boss fight. Need to watch my step in the beginning. A lot of bombs get thrown. Curling up next to the bus is very safe. I crouch rocket the boats, but accidentally get fat, probably lost a second overall cause of slow walking. As soon as I get into the tank, it goes great. Flawless A.P. pickup, vehicle tear through and boss fight. Gold! Oh streetside, how many runs have you ended? That first bomb wouldn't move at all! Even after destroying the car hiding him. I need to destroy cars for the two bomb drops. In the subway, I handle the copters well and get a quick skip after destroying the two tanks, so I know I'm ahead. I back up on the trains to negate the soldiers that spawn from above. The underground was awesome too. I always decapitate the last soldier with a cannon round. Boss fight was 99% flawless. It didn't move, but shot a fast speed spark. A slow spark would have let me kill it without any damage. Double Gold! I nail the opening! And the wavy bridge! Allen... He rushed me quick and I accidentally jumped. I spam bombs for a quick kill once spawned, but lost a couple seconds to him. Once inside, it's time to unleash the rage. I will not be denied. Again, I pick up 2nd Lt Hyakutaro. On one player, he is mandatory on the Final Mission. It costs no time to get him and he wrecks house. Just watch the Final Boss for the godliest drop I've ever seen. Triple Gold! 2-player Easy: 0:19:45 by Jeremy Doll and Christian Welsh. As I always like to do first, Thank You to SDA staff! I've been around for many years and seen the changes that have occurred and this site remains the only place I actively visit and post on. Thank you for keeping this such an awesome place and community to share, and post great runs by many runners. As I always ask Koopa Kid when we start attempts. What Metal Slug is it? TWOOOOO! Pretty self explanatory. Only stop for ammo and bombs, boss is perfect. Once inside, going up the hill, Koopa Kid came up with the jump pattern. It is optimal because it keeps us moving, but avoids getting turned into a mummy. As we start climbing the tower, you'll notice a few places where we stop for a moment. This is necessary as the screen won't scroll up unless we are both on a certain platform, not just being in that area, but flat-footed on that particular platform. Perfectly synchronized on the boss. Really happy with how this came out. This is one of the harder stages to manage lag and there is a lot going on. We got the bad death animation on the last boat, but otherwise was a great stage. We manage our resources perfectly for the boss fight. Plenty of ways to die starting this level. We do everything great through the two boats, but I get fat. That's how we plan though since I end up in the Slug. We rescue the prisoners after the boat as we need the ammo, but we are also hoping for a lucky shotgun drop. It's random though and Koopa Kid gets a Heavy Machine Gun. It saves time as Shotgun is OP, but again, totally random. Koopa Kid does a great job of keeping things moving down the hill as I need to wait for my Armor Piercer shells. The boss goes after me, which is optimal since I'm tanked up. The hardest part for us overall, we call it streetside. We actually nail it. We do stop as we need to get the two bomb drops from the cars. Inside the subway, we basically death abuse. The tank that kills us lets us skip a tank that normally spawns on the left, this saves around 10 seconds. It isn't 100% consistent, but we got it this time. In the final part, I miss a bomb drop which loses a couple seconds on the boss, but still way ahead with the tank skip overall. This opening is one of the hardest parts of the Slug series. The sniper gets Koopa Kid, I jump and knife, but it missed so I get shot. However, I get the next rocket soldier and Koopa Kid keeps the screen moving. My missed jump is because of the input delay that Anthology has, blah. It's always on this part, happens to me in X also. Only lost a couple seconds here. Strap in for the rest of the run. Death abuse for super quick Allen fight. Once inside the compound, it's all about bomb conservation for the boss. Also, 2nd Lt Hyakutaro is priceless. Another Koopa Kid strat was to pick up the shotgun and save it for the final boss as there are three consecutive shotgun drops. I bulldoze the aliens so Koopa Kid can save shotgun for boss time. Strong setup is strong. Aliens never saw us coming.